Don’t you HATE when you are starving at the end of the day but have no inspiration for cooking? 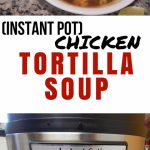 This Instant Pot Chicken Tortilla Soup Recipe has rocked my world! I just tossed a package of FROZEN SOLID chicken breasts in the instant pot and had a delicious meal in no time. This chicken tortilla soup will warm you up on a chilly fall or winter day. My husband and I LOVE this recipe. I had to write it down and make it into a blog post to make sure I remembered it to make again and again. I hate making a meal that is flavorless or lacking that rib-sticking power to satisfy everyone. My husband is a BIG dude and I work hard keeping him fed. 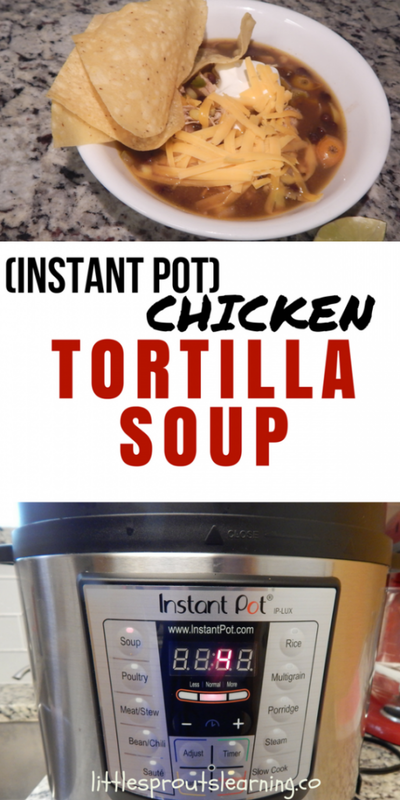 He loves Mexican food and this instant pot chicken tortilla soup is right up his spicy little alley. Sometimes I feel like I’m too tired to make dinner, but this chicken tortilla soup was so simple, I didn’t mind making it multiple times. I have a home daycare, so I work HARD all day. 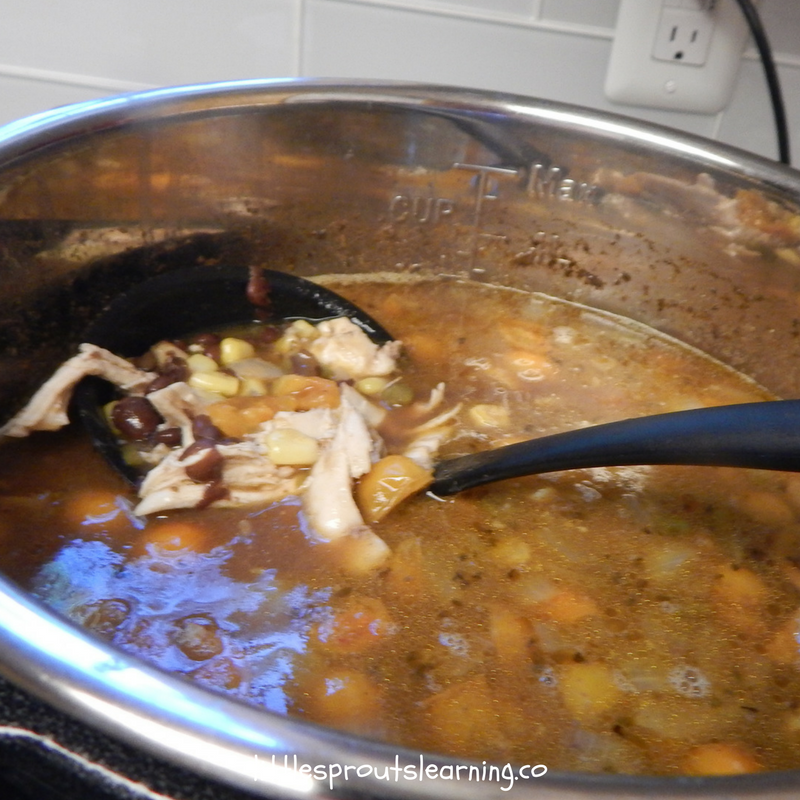 It’s wonderful to have an easy soup recipe that satisfies. Don’t you hate when you didn’t plan something for dinner and all your meat is frozen solid? The instant pot is great for those times because it will still cook the meat through, evenly and with the flavor you add to the pot even if your meat is frozen solid. I’ve cooked a frozen roast in the instant pot, a frozen pork roast, and many times I’ve cooked frozen chicken breast in my instant pot. It will even cook a frozen whole chicken. That makes it a miracle tool to me. It’s gotten me out of more than one pinch. And I love how it doesn’t heat up my kitchen in the summer. It’s a great fix for dreading making dinner because of the heat. 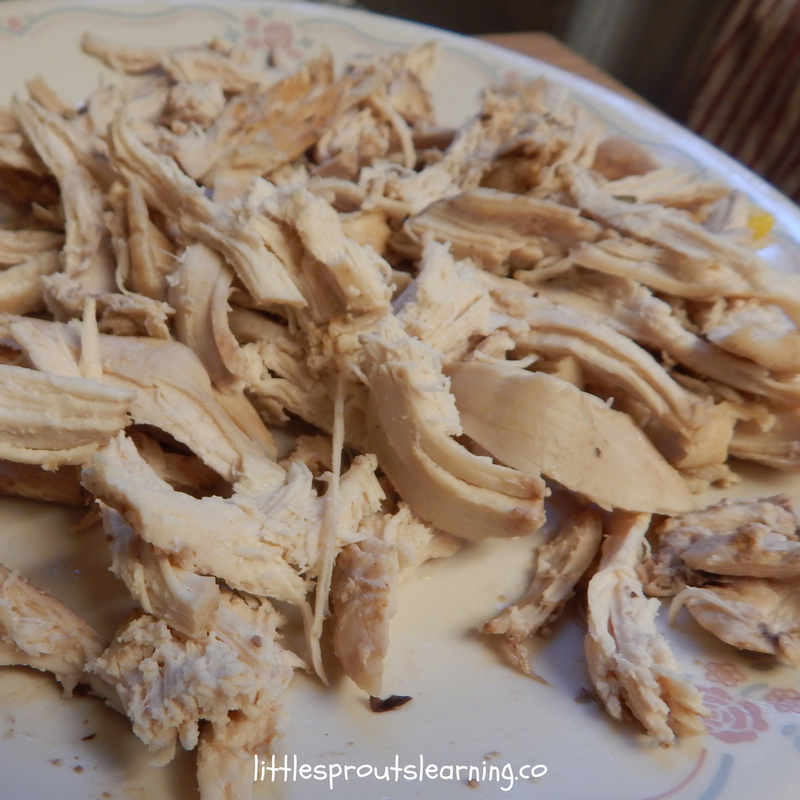 These frozen chicken breasts cooked perfectly in the instant pot, but I’ve cooked thawed ones for this recipe as well and they turned out great too. Grab your instant pot and a package of chicken breasts and let’s get going. 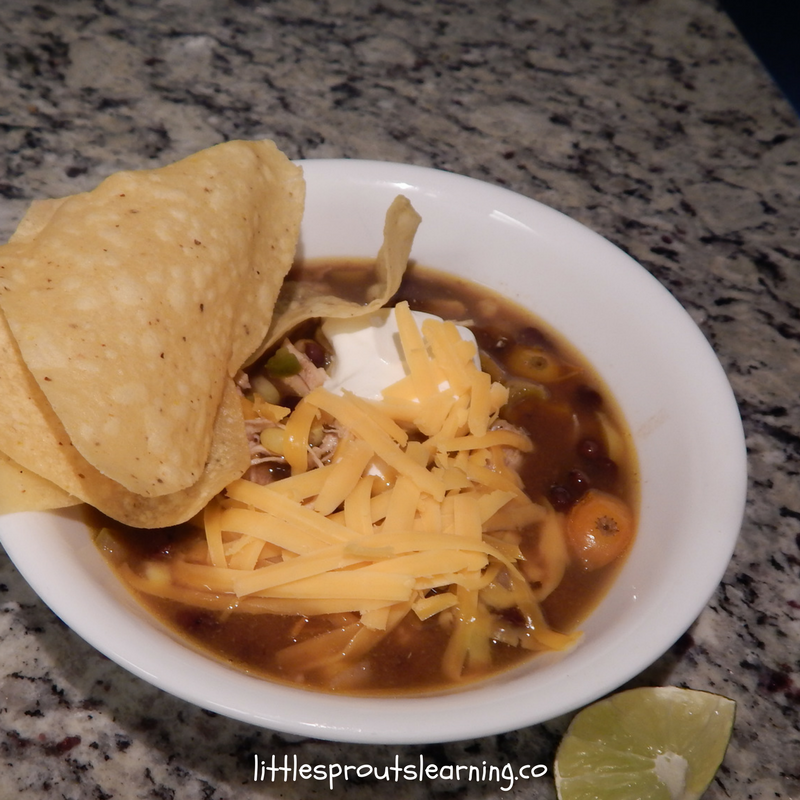 Savory, satisfying chicken tortilla soup to warm you on a cold day and fill your tummy with yummy goodness. Instant pot recipe. 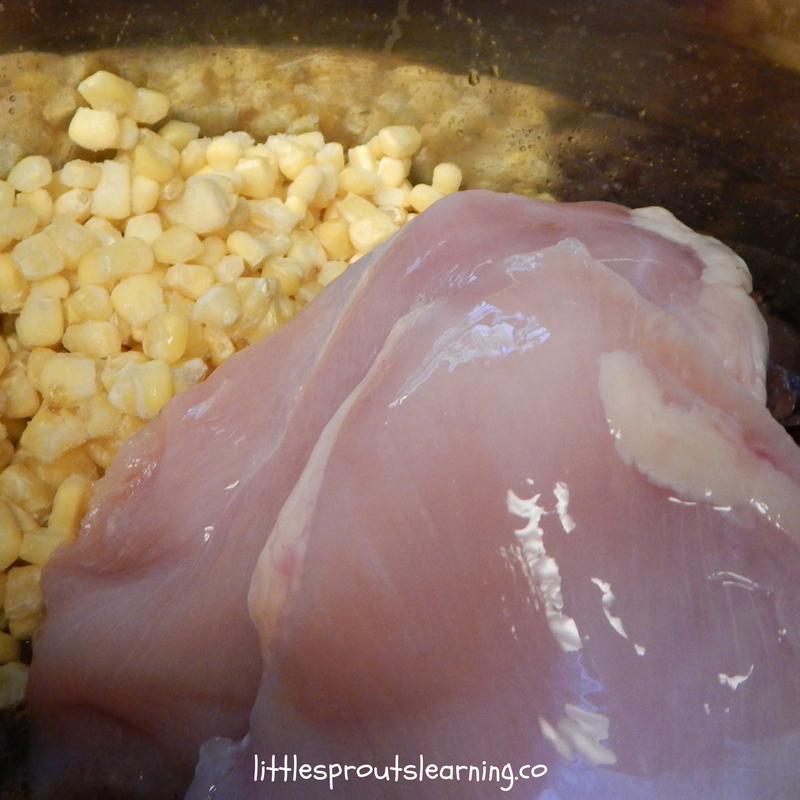 Add tomato, black beans, corn, stock, spices, and chicken. Cancel sauté and cover with lid and seal. Select soup and set timer for 4 minutes. It takes about 10 minutes to reach pressure and then the 4 minutes will begin. While the pot is cooking, you can prepare the toppings. When the timer goes off, manually release the pressure carefully not to get burned. Remove the breasts to a plate and shred meat. 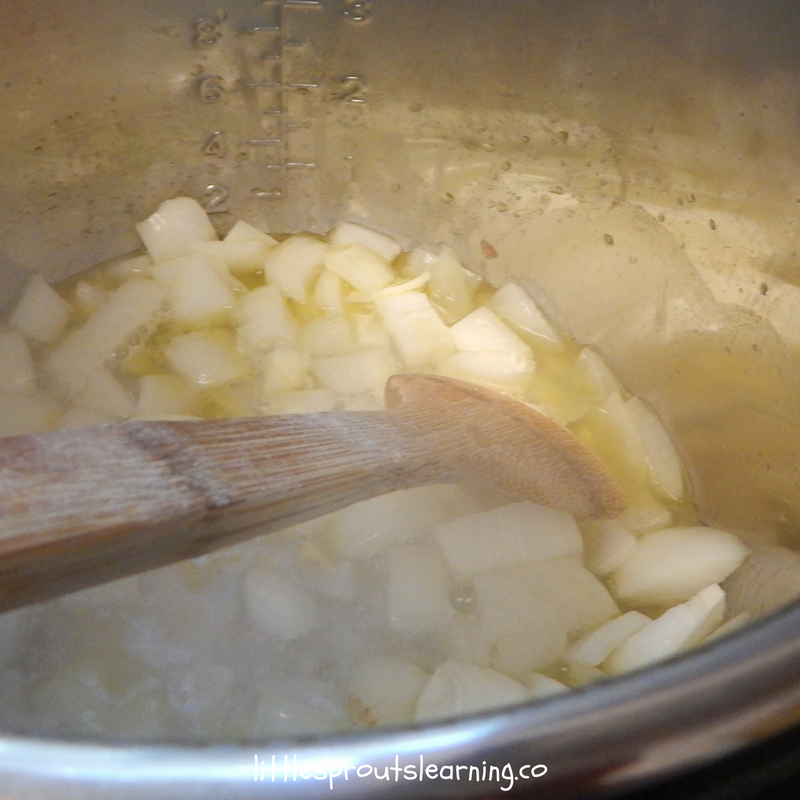 Replace the shredded meat into the pot and stir. I promise you this soup is going to knock your socks off. It’s one of the best things that I’ve ever made and I cook multiple meals every day. I love soup season, I love chicken tortilla soup, I love cool weather and I love to cook food that nourishes people’s soul and their bodies. Can you use frozen chicken breasts and if so how much time should I add. I have used frozen and didn’t adjust the time. I could not get my PRINT button to work. Do I need to do something different on my end to get it to print?? I appreciate any advise as I want to save this to my homemade instant pot cookbook!! I’m sorry the button isn’t working, I’ll submit a support ticket and see if i can get some help with it. You could also highlight and print it with your browser or copy and paste it into a word document and print it. Thank you for letting me know! Thanks for checking it out and for your comment. It’s so yummy.